I was in 重庆市Chongqing City in the August of 2001. From its port I took a cruise down to 宜昌市Yichang City where I made a right turn north toward 武当山Wudang Shan (Wudang Mountains). The river is 长江Changjiang (literally, the Long River), also known as 扬子江Yangzi (still known in the non-Chinese world by its archaic transliterations: Yangtze or Yangtse River), and through it my boat passed the legendary 三峡Three Gorges (created when the river cuts through the Wushan mountains) as well as up through the locks of the gigantic 三峡大坝Three Gorges Dam. Changjiang is the longest river in Asia, and the third longest in the world. It is also the heaviest and the deepest with over 1000 lakes and 700 tributaries along its more than 6000km length. From its 5000m high origin in the 昆仑山Kunlun Mountains of 青海Qinghai its torrential water drops eastward to less than 1000 meters, and finally disappears at the coast of 上海Shanghai. Close to 400 million people, and probably its equivalent in plants and animals, depend on the river for their livelihood. While the 黄河Huanghe (Yellow River) claims to be the "cradle of Chinese Civilization", Changjiang can claim home to some of the oldest humans in the evolution chain. This unique river is a world by itself. My Yangzi cruise to Yichang took about 2 days and a night. But not being a tourist boat, it did not maximize its time to be around the best scenic spots; so that I was asleep when it passed much of the Gorges and through the locks. But through an off-boat tour arranged on the boat, I was able to enjoy the beautiful gorges of the smaller rivers and streams, and the lively locals. Historically, the river has been an important transportation artery linking the interior with the coast; through this function the river gather a rich cultural history. 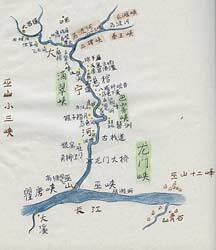 Of interest to this page is the area between 重庆市Chongqing City and 宜昌市Yichang City. Along the way are many historical artifacts and structures (such as the 张飞庙ZhangFei Temple that I visited) which reminded us of historical events (such as the famous 赤壁战Battle of the Red Cliff (year 208) which is one of the major events that conveniently ended the 400 year long 汉朝Han Dynasty (202BCE - 220AD) a little later and set the stage for the 三国Three Kingdoms Era (222 - 280)) that this burdened river had played a part. In the river areas, transportation by boat is still quicker and more efficient. A mother and son among tourists near a pier. A mother and three daughters selling on one of the tourist paths to the Three Little Gorges. Three girls walking dangerously along the river bank. A group of locals ruxhing to the tourist scene to sell stones and food. A family of three in a corn field by the shore. A woman, with her basket, is walking briskly on the long gravel riverbank. She is spending her day finding worthwhile stones to sell to tourists. You can get the ticket from your hotel, which is convenient but of course you pay more. You can get the ticket from travel agencies or reliable booking agents, such as CITS, who can put you together with other foreign tourists on higher quality luxury boats. On these big boats (which may be in the shape of a dragon), you can enjoy the spectacular sceneries in style. Of course, you pay much more. But if time is money and — more importantly — you wanted no surprises, this is the best option. Or, you can get the ticket directly from the boat ticket office at the 朝天门码头Chaotienmen Dock. — in 襄樊Xiangfan on my way to the 武当山Wudangshan mountains in 河北Hubei Province. I could take the bus there but I am tired of the buses and I wanted to see the Three Gorges. I always wanted long trips on a boat so I planned well for this. If you would like to see the colossal 三峡大坝Three Gorges Dam on land, you may take the bus from Yichang, which I did. Boats dock on the banks of the Changjiang River. Up the banks are the river towns that depend much on the great river. From one of the companies I brought a 2nd class ticket (with 3 beds and 1 shower/bathroom) to Yichang. It is a good idea to get at least a 2nd class ticket if you like to use the boat's deck to view the gorges. Any class below that may give you trouble accessing the deck. You get what you pay for. At noon, I checked out of my hotel, which is a walking distance from the dock. I left my bags there and used the rest of the afternoon checking out other places. At about 6pm I got on the boat. The boat ride took 2 overnights and arrived at the third night. My roomates were two party members from 广东省Guangdong Province. They were heading somewhere (not Yichang, further but I forgot where) for official duty of some sort. They appeared very comfortable and knowing — appeared that traveling was something of a routine for them. Since we are from the same province we spoke in Guandong dialect. We spoke a while then someone came to exhange our tickets with tags (I think that was what happened. At the time I did not keep a log of my travel. Usually the ticket would be held, so that they know who will be getting off when and where. They will come to back to you to reverse the exchange when the time comes. It works like an alarm clock. Great. But do not lose the tag, of course. Since tickets have no customer's name, I developed a habit of writing my name in the back. In case the ticket is misplaced or someone is caught taking it, at least I can identify it. But I never had a single problem. 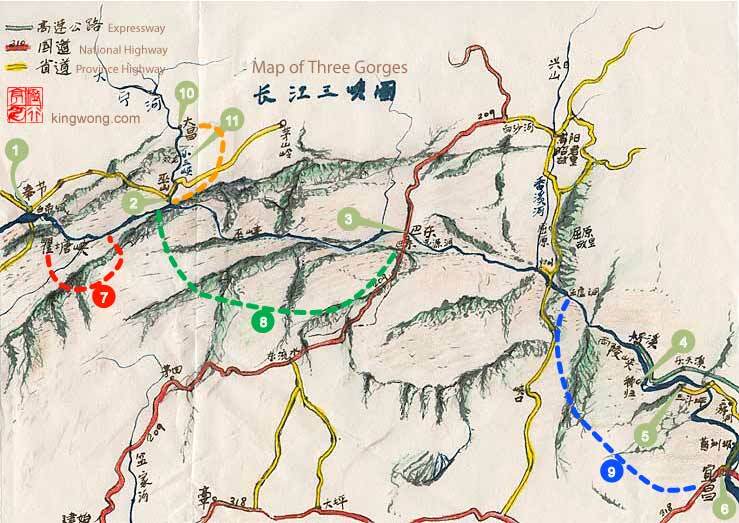 Soon another person came by to offer group tours of the nearby attractions and a cruise on the 小三峡Little Three Gorges (see map above: orange bracket indicates this scenic area). The price was over my budget, so I declined. But my roommates bought the tickets and convinced me later that get my own as well. It was a good thing that I joined the tour since most of the interesting and dramatic scenes were from these smaller rivers — because the gorges are narrower, the cliffs are steeper, and the sight of locals made it more alive. The boat docked near the attractions for hours at a time for the three days. During those time, the tour guide took us through the river towns — for the other attractions which include 丰都 (鬼城)Fengdu (Abode of the Ghosts); 白帝城Baidicheng (White King Town, the place where 刘备Liu Bei, the dying King of 蜀汉Shu Han, one of the three states of 三国Three Kingdoms Era, made his final wishes); and 张飞庙Zhangfei Miao (Zhangfei was one of the era's legendary general under Liu Bei. This temple was built to honor him.). While you are in town, you may load up some food. 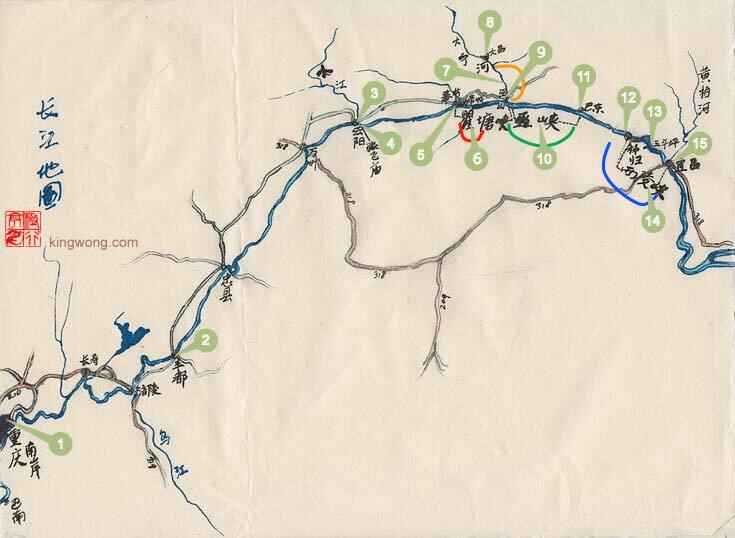 You may, of course, visit these areas on your own because they are just up on the banks, but getting to the 小三峡Little Three Gorges (orange bracket on the above map) on the 大宁河Daning River requires that you know where and be able to get the boat tickets. If you decided to go on your own, bring all your belongings — in case you could not make it back on time, you can catch the next boat. Yangtze River Cruises:Yangtze River cruise tours of private and China tour packages and small group with Beijing, Xian, Tibet, Shanghai, Guilin, Hong Kong and ship schedule information.